We know the importance of sourcing local ingredients, and we’re proud that our Essence™ Tea Tree Oil comes directly from down under. You’re probably aware that tea tree oil comes from the leaves of the tea tree plant Melaleuca alternifolia. It’s likely that Indigenous Australians were the first to recognise the medicinal properties of the plant, with the Bundjabung Aboriginals of northern New South Wales teaching about the ‘healing’ properties of ground water that contained fallen, decomposing tea tree leaves (1). Australia is the native habitat of tea tree. It thrives in subtropical coastal areas in northeastern New South Wales and southern Queensland and doesn’t naturally occur outside of Australia (2). So unlike the lamington and pavlova, there is no question where this plant originated! Today there are commercial plantations in Western Australia, Queensland and New South Wales, with the majority in northern coastal New South Wales. Australian tea tree is even cultivated as far away as Brazil, China and Kenya. The chemical composition of tea tree oil is strictly measured and defined by international standards which specify the levels of key compounds found in pure Australian tea tree oil. It also specifies a number of physical parameters, including appearance, colour and relative density. Within the highly competitive essential oil market, manufacturers have been known to cut corners. Tea tree oil production is no different; up to 50 percent of commercial samples may be adulterated with additives including vegetable oils, eucalyptus, pine, camphor, by-products of other industries and synthetic oils (3). It can also be contaminated with other species of Melaleuca that don’t meet the ISO tea tree oil standards, resulting in inferior quality. When it comes to tea tree oil, you could say that it’s fair dinkum top notch! 100 percent pure Australian tea tree oil has been scientifically studied and recognised for more than 70 years and is the only one that meets Australian and International quality standards and safety. 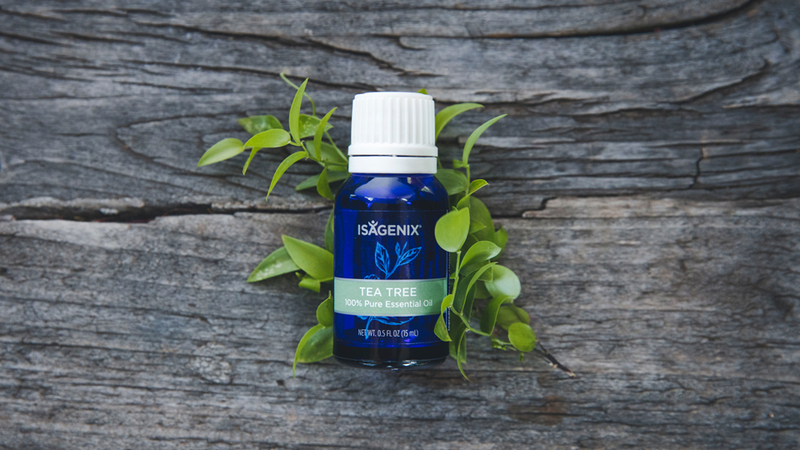 You can rest assured that every bottle of our Essence by Isagenix Tea Tree Essential Oil contains only the best that nature has to offer – and that is 100 percent pure Australian tea tree oil. Carson CF, Riley, TV. Antimicrobial activity of the essential oil of Melaleuca alternifolia. Appl. Microbiol. 1993. 16:49-55. Carson CF, Hammer KA, Riley TV. Melaleuca alternifolia (Tea Tree) oil: a review of antimicrobial and other medicinal properties. Clin Microbiol Rev. 2006;19(1):50–62.